The Shuttle Landing Facility, near Kennedy Space Center, is a giant runway measuring 15,000 feet long – that’s 2.84 miles – and 300 feet wide. Space Shuttles landed here 78 times, touching down at 214 to 226 miles per hour after gliding in from orbit. Not a bad place, then, to drive a car that’s capable of 209 mph. 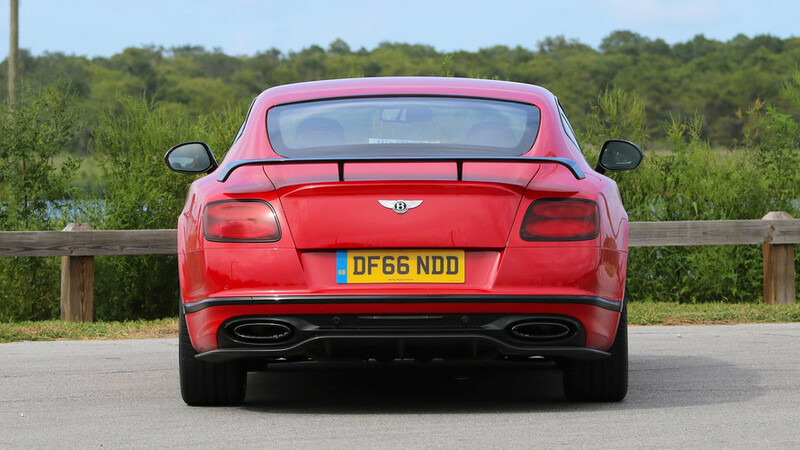 The car in question is the Bentley Continental Supersports, the final and most extreme road-focused version of this generation of the Continental GT. It’s got 700 horsepower and 750 pound-feet of torque under the hood, giant carbon-ceramic brakes, plus new bodywork to provide more cooling and more downforce. And I’m strapped into one, ready to see just how close to that 209-mph mark I can go on this historic strip of concrete. The car just pulls and pulls, the digital speedometer leaping in multiple digits at a time. 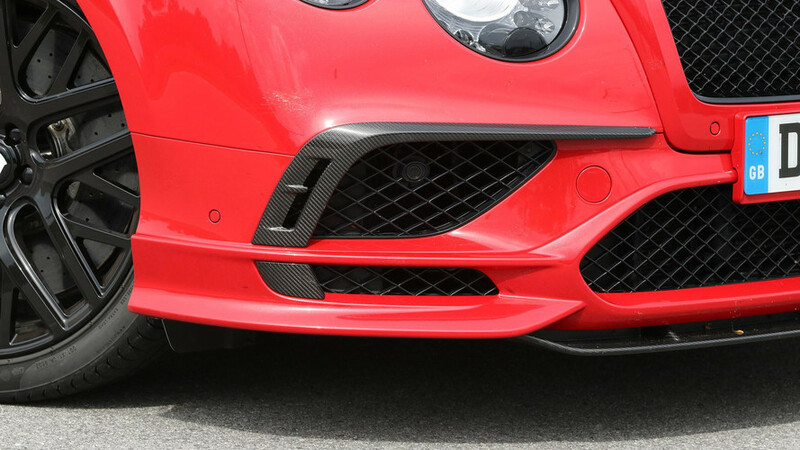 There’s about one-and-three-quarter miles between our starting point at the runway’s north end and the big “Stop” sign that signals the point where we need to exercise the carbon-ceramic brakes to start scrubbing off speed. A Bentley driving instructor riding shotgun radios to confirm the runway is clear, then I mat the gas pedal to see how fast I can go. Even rolling onto full throttle (the instructors asked us not to launch the car too aggressively), the Supersports tears away from the line. In ideal conditions it’ll reach 60 mph in 3.4 seconds – quicker than a Chevy Camaro ZL1. Even on a 91-degree Florida day, it’s ferocious in the way it runs to 100 mph. I’m riding a tidal wave of torque that seems to pull from idle and never let up. The car just pulls and pulls, the digital speedometer leaping in multiple digits at a time. By the time I crest 120 mph, there’s a noticeable crosswind buffeting the car around. Eyes looking way ahead, it takes only the minutest steering inputs to keep the car in line. An impressive sense of straight-ahead, noticeable even at normal freeway speeds, makes things relatively relaxed as speeds build. The Supersports is not only incredibly quick and fast, it’s also supremely comfortable and plush while you’re going fast enough to cross a football field in 1.3 seconds. The engine roars, wind noise whistles, and the car continues to build big speed second after second. The speedometer just ticks past 191 mph before I start braking. Even then, I don’t have to raise my voice to talk to the instructor sitting in the passenger seat. And did I mention we had the air-conditioned seats running the whole time? 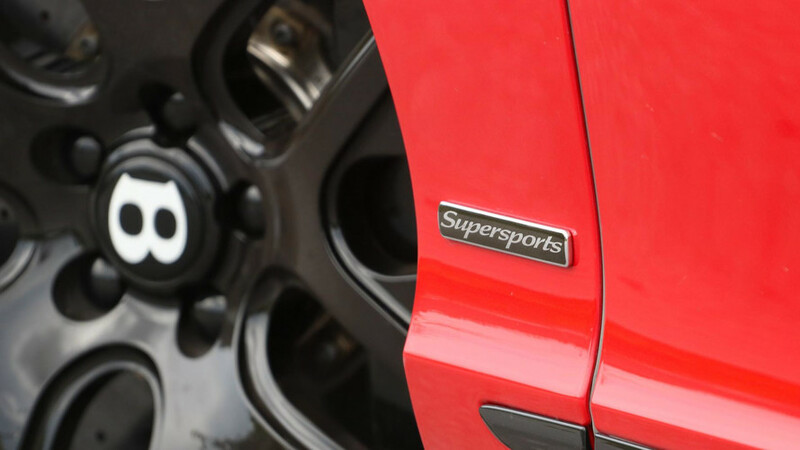 The Supersports is not only incredibly quick and fast, it’s also supremely comfortable and plush while you’re going fast enough to cross a football field in 1.3 seconds. 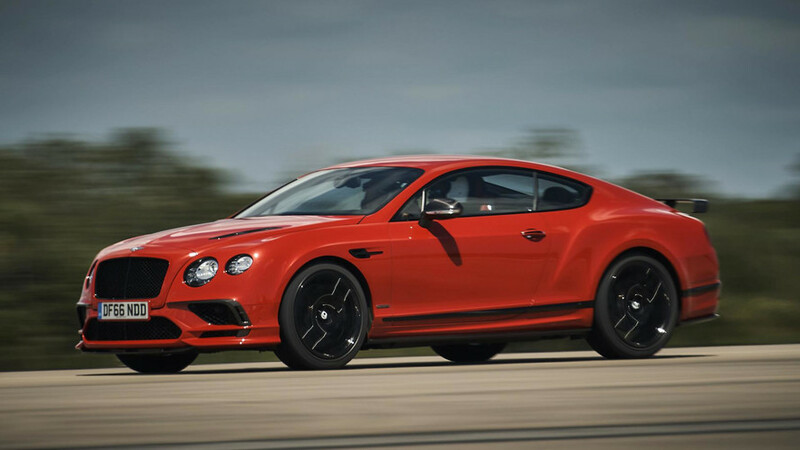 All that extra pace is enabled by a reworked version of Bentley’s 6.0-liter biturbo W12, which makes 67 hp and 130 lb-ft more (for 700 hp and 750 lb-ft) than in the Continental GT Speed thanks to new twin-scroll turbos and a new crankshaft. An upgraded torque converter distributes power to the eight-speed automatic transmission, and a standard all-wheel-drive system connects that to the 275/35ZR21 Pirelli PZero tires. The 21-inch wheels are made from forged aluminum, saving an impressive 22 pounds per corner. 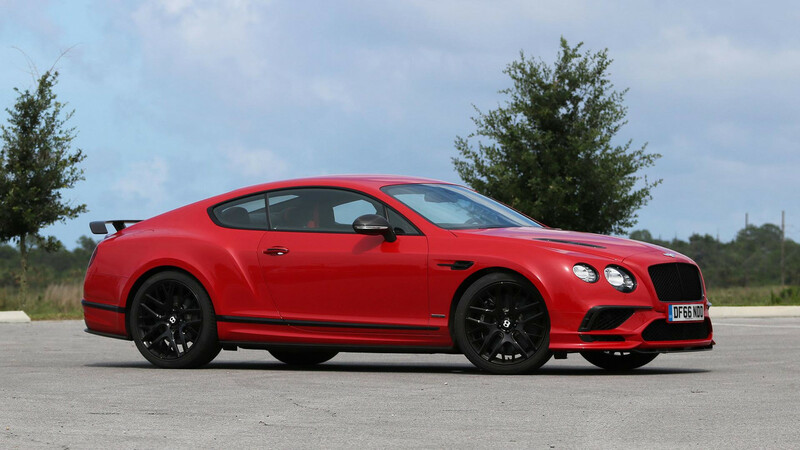 Behind them are carbon-ceramic brakes; not only is the Supersports the only Bentley with standard carbon brakes, the company claims they are the largest on any production car, at 16.5 inches in diameter in front and 14.0 inches in the back. The car feels like it shrinks around me, willing me to fling it around the cone course time and time again. The Supersports is also the only Bentley (except for the extreme, 300-unit-only GT3-R from 2014) with torque vectoring; the car’s computers can squeeze the inside-rear brake to improve cornering turn-in. And it has more downforce than any other road-legal Bentley besides that GT3-R, thanks to the functional carbon-fiber splitter and rear wing. Various hood vents and enlarged inlets in the front fascia help cool and feed the beefy engine. Another great dinner-party trivia piece: The windshield wiper motor has a higher torque rating than the starter motor to ensure the wipers will still work at the car’s rated v-max. Not that I’d recommend driving in the rain at 209 mph. But if you wanted to, you could. While we’ve got a giant runway at our disposal, we also throw the Supersports through a coned-off slalom course. “It is the most agile W12 we’ve ever produced,” promises Bentley product marketing manager John Simons, and he’s not wrong. I’m surprised by how deftly the Supersports turns in with just a few degrees of steering, and by how much rotation is available, especially with the adaptive suspension set to its sportiest mode. Use the throttle to plant the back end again, then simply lift and steer to get through the next gate. With each run I up the speed, yet there always seems to be grip in reserve from the Pirellis. 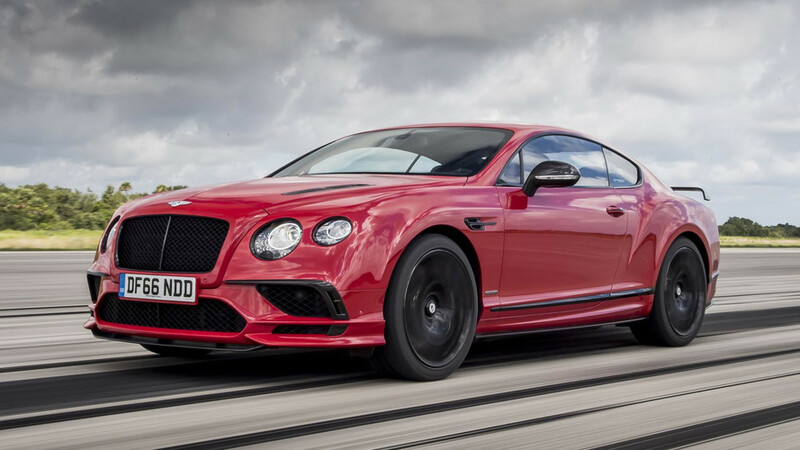 Yes, it’s a big, heavy “grand tourer,” but the Supersports will dance without much fuss. The car feels like it shrinks around me, willing me to fling it around the cone course time and time again. 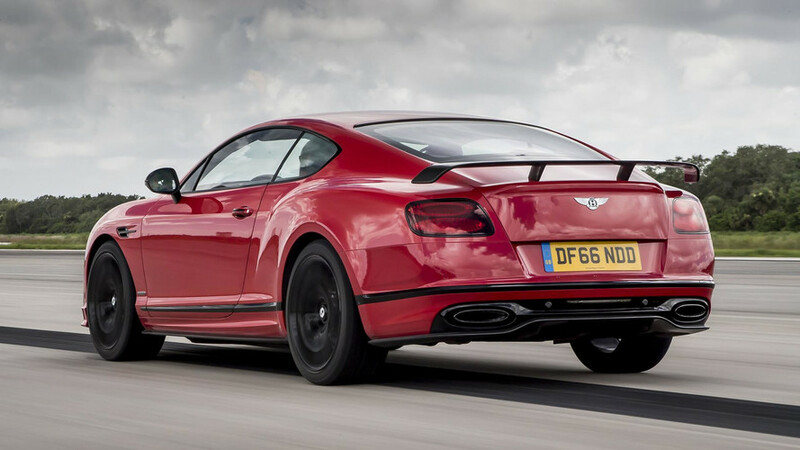 The Supersports is a fantastic send-off for this car because it exemplifies all that Bentley has managed to deliver with the Continental GT. Soon thereafter our time at the Shuttle Landing Facility is over, and it’s time to see what the Supersports is like in more pedestrian driving on Florida’s dull, flat highways. The answer: Pretty much like any other Bentley. I dial the suspension setting back to full-comfort, turn on the seat massager, crank up the Naim audio system, and set the cruise control. The car floats and glides over the road, muting untoward road and wind noises, the engine purring and the transmission slipping between gears without any fuss. If I had ended up missing my flight – and I came pretty close – I would have been more than happy to simply drive the Supersports all the way home to Michigan. Not that the car doesn’t show its age: The dated navigation system’s low-res maps and clunky menu structure disappoint, and there’s still a giant keyhole in the dash even though the car has push-button start. Nor does it offer Apple CarPlay, Android Auto, or even a USB port. You will find a six-disc CD changer in the glovebox as standard, though. But it’s hard to really care about those gripes when I’m sitting in sumptuous hand-stitched leather seats, touching knurled-metal accents, and gazing upon details like the organ-stop vent controls and accent-stitched steering wheel. 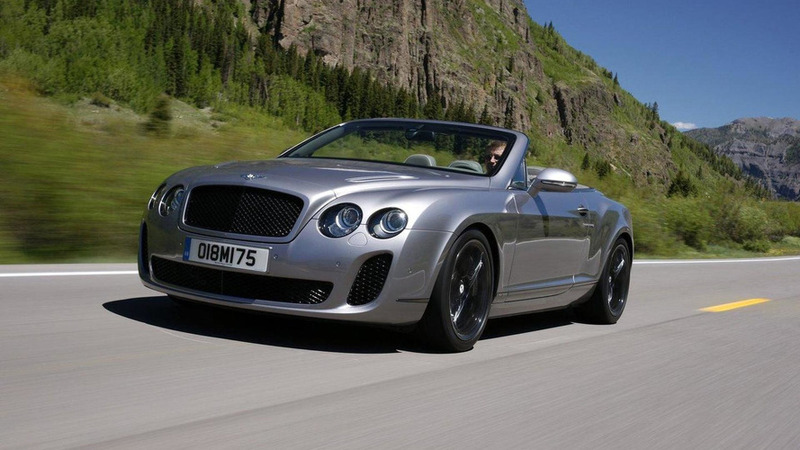 For those who prefer to get a tan while going fast, there’s the Bentley Continental Supersports convertible. Owing to its extra 385 pounds of mass and slightly compromised drag coefficient (0.32, top-up, versus 0.31 for the coupe), its performance ratings are a little behind the coupe’s: 3.7 seconds to 60 mph and a 205-mph top end. 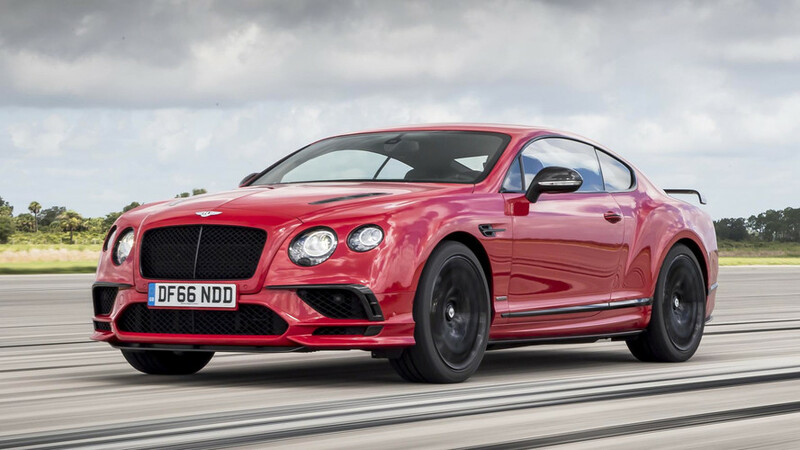 But Bentley says that about two-thirds of all the Supersports to be sold in North America will be convertibles, the same ratio as for the rest of the Continental GT lineup. A total of 710 cars will be produced globally, matching the car’s engine output in PS; 250 of them are destined for North America. At $293,300 for the coupe and $322,600 for the convertible before destination charges, gas-guzzler taxes, or any options, the Continental Supersports is not for everybody. Still, nearly all the coupes coming to North America are already spoken for, and Bentley has taken orders for about two-thirds of the convertibles bound for our shores. 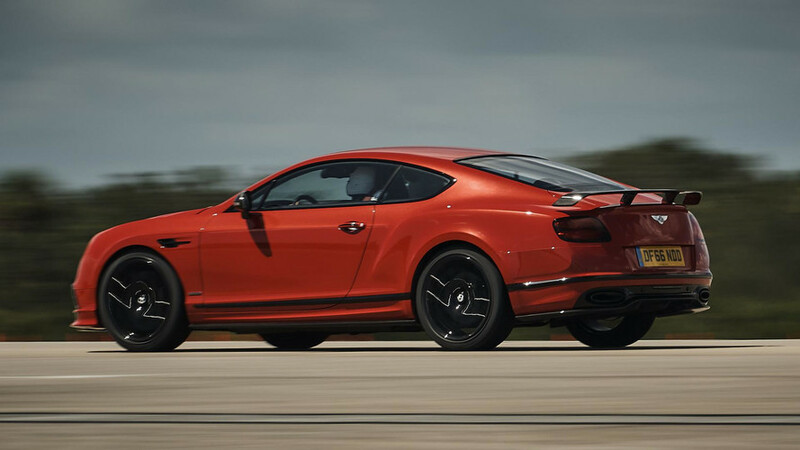 Whichever way you look at it, the Continental Supersports is a fantastic send-off for this car because it exemplifies all that Bentley has managed to deliver with the Continental GT. There is incredible, supercar-level performance available if you want, and presidential luxury if you want that instead. 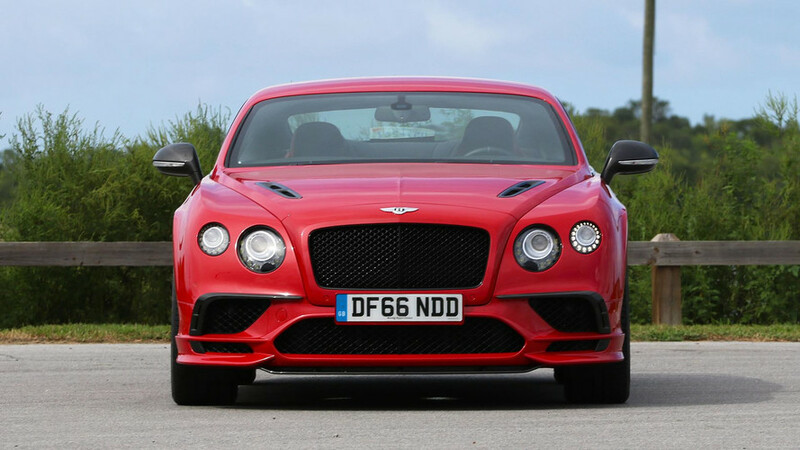 Of course, it’s pretty much the end of the road for this car; Bentley admits that the new Continental GT will be shown later this year at the 2017 Frankfurt Motor Show. But if the next-generation car can improve upon this iteration’s huge breadth of capability, well, it’s hard to imagine being able to find any fault with it at all.